Pleasanton, CA  Aspectrics, Inc., the innovator of patented Encoded Photometric Infrared (EP-NIR) and Encoded Photometric Near Infrared (EP-NIR) spectroscopy, will be unveiling the novel EP-NIR 2750 and the innovative EP-NIR 2750i biofuels analyzers. This further extends the Aspectrics range of EP-NIR analyzers developed to respond to scientists' needs working in process, biofuels, ambient air monitoring, stack gas analysis and speciality gases industries. Aspectrics' EP-NIR biofuel analyzers feature an ultra fast scanning rate of 100 scans/second while achieving an impressive spectral range of 128 photometric channels and enables users to monitor their processes in real time. Aspectrics' new range of biofuels analyzers will be unveiled on booth #84 at Biodiesel Expo 2007, Newark Showground, Nottinghamshire, UK, October 17-18, 2007. Aspectrics' comprehensive EP-NIR 2750i biofuels at-line system allows users to carry out biodiesel quality control and analyze biodiesel blend ratios in real-time. Fast and accurate results are delivered within seconds. The 2750i features the revolutionary Aspectrics EP-NIR technology, the new Aspectrics eCalTransfer capability and an integrated sample interface. Aspectrics' new eCalTransfer capability means a calibration carried out on one system can be transferred to another without the need to recalibrate, delivering substantial time and cost savings. In addition, the new touch screen LCD interface is easy to operate and displays sample results in real-time. Also to be presented on booth #84 will be Aspectrics' Multicomponent EP-NIR 2750 analyzer whose applications have recently been extended to perform reliable and accurate quality control measurements of biofuel, including the methanol, water and total glycerine content in biodiesel and water content in ethanol. By giving instant pass/fail results, the compact and ruggedly designed biofuel analyzer helps manufacturers and buyers to ensure that the quality of their biofuel meets the recommendations of biofuel regulations, avoiding the extra costs incurred in non-compliant samples. The analyzer's highly flexible platform, which is easily integrated into the on-line environment, has recently achieved Military 202G method 204D certification for its resistance to vibration and delivers highly consistent results over long periods compared to traditional Fourier Transform Infrared (FT-IR) systems. 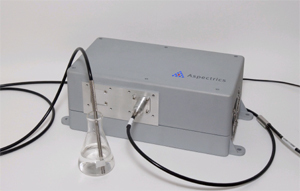 Aspectrics' at-line packages include a MultiComponent spectrometer, instrument control and data processing software as well as an optimized sampling accessory or method development bench. Encoded Photometric Infrared (EP-IR) spectroscopy is a breakthrough for the process monitoring industry, providing ultra fast sampling capability (100 Hz) for multi component analysis in a rugged design.